This place is a little well kept secret. Hospitality was great. RARE restaurant has amazing food. Would definitely recommend this place and is definitely going back. My wife and daughter enjoyed their stay at the Affinia Shelburne. The staff was warm and pleasant, and their doorman was very kind and helpful. I will definitely stay there again on my next visit to NYC. Hotel Staff was very friendly and helpful. Location was great! I wish there were more outlets in the room for charging phones, computers, etc. Water in the lobby would be nice. Spacious rooms, great manager named Ron who helped us rebook our room when our flight was cancelled - no penalty. Good location, room is comforrtable, staffs are nice, Only one thing we don't like is we can hear noise from the street in the 2am. Staff really stood out as rude, which lessened the whole experience. Pretty nice facility, but there's no way the room we got was 300+ sq feet which is what our reservation was booked for. Overpriced like many other hotels in nyc, especially around the holidays. Bed wasn't the most comfortable. Mainly leaving a review because a few of the staff members really rubbed me the wrong way. The last thing you want when you walk into a hotel after traveling all day is for the bellhop to have an attitude. Isn't it part of their job description to be friendly and welcoming? The bellhop asked how many bags we had and as I began to count them, he yelled "JUST PUT THEM DOWN!" .. umm OK then! Never experienced such an attitude from a bellhop before. And this was just the beginning of several other unfriendly and unwelcoming staff members. The resort fee wasn't really worth it for us, the "cupboard" where you had $10 per day to spend really only covered 2 snacks or 1 liter of water. However, we would gladly stay here again because the rooms are very spacious for this price point and it's conveniently located. This hotel was really decent for the price. It’s in a great location (a few minute walk to grand central) and staff was friendly. It’s definitely outdated, but the bathroom was the more updated part of our room. If you want ice you had to ask the front desk which was odd and that took like 30 minutes. Other than that it was a great stay! Large room, great amenities (kitchenette), water pressure good, view of Chrysler building, the $10 daily credit nice considering resort fee high. Only negatives were the free wine hour was not offered one night, the rooftop bar not open and the Rare room service took its name too seriously. Nice location but rooms are dated. Even when asked to be changed to a new room after being placed in one with stains everywhere the new one needed work too. It’s a very “meh” hotel for the price point. Be aware that there's a $35 or $40 a night facilities or some kind of charge that you don't know about until you are checking in. They put me in a disabled room which meant I had nowhere in the bathroom to put anything but did appreciate the large walk and shower. 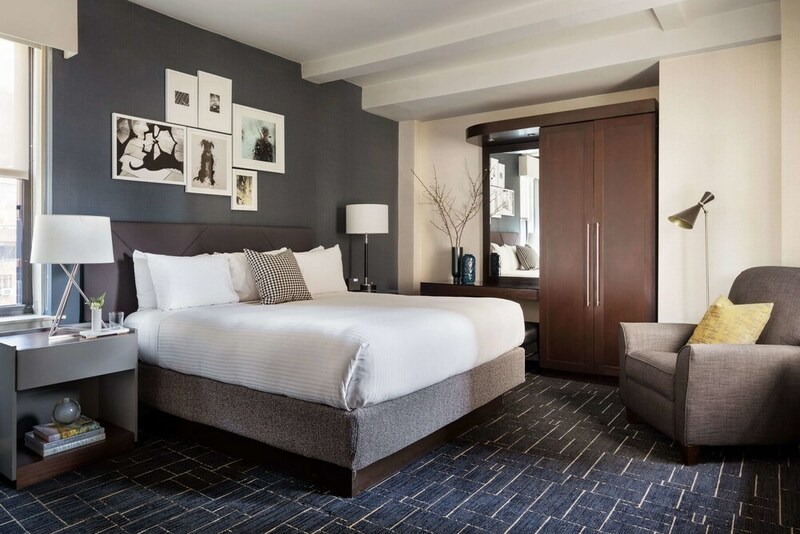 Located in Midtown, Shelburne Hotel & Suites by Affinia is within a 10-minute walk of popular sights such as 5th Avenue and Madison Square Garden. This 324-room, 4-star hotel has a restaurant and a bar/lounge, along with a health club. Enjoy a leisurely bite to eat at the onsite restaurant, or have a drink at the bar/lounge. Savor a meal from the comfort of your room with room service, or make new friends at the free daily manager's reception. For your convenience, a full breakfast is served for a fee on weekdays from 7:00 AM to 11:00 AM and on weekends from 8:00 AM to 11:00 AM. All 324 rooms provide coffee makers and phones. Guests of Shelburne Hotel & Suites by Affinia enjoy a health club, free WiFi in public areas, and a business center. Valet parking is available for USD 75 per day. The 24-hour front desk has staff standing by to help secure valuables, and answer any questions about the accommodations. Additional amenities include a free grocery shopping service, express check-out, and laundry facilities. Rare View Rooftop - Rooftop bar. Open select days. Rare Bar and Grill - Restaurant and bar specializing in American cuisine. Open daily for breakfast, lunch, and dinner. Recreation features at Shelburne Hotel & Suites by Affinia include a health club.